I found the paper as I was searching the internet for papers on banking regulation and property rights theory. If we fundamentally want to understand banking crisis we should understand incentives and property rights. Who owns “profits” and “liability”? Who will be paying the bills? The banks’ owners, the clients, the employees, the bank management or the taxpayers? If property rights are badly defined or there are incentive conflicts we will get banking troubles. In that sense banking crisis is a constitutional economics problem. Therefore, we cannot really understand banking crisis by just looking at specific issues such as how much capital or liquidity banks should hold. We need to understand the overall incentives facing all players in the “banking game” – owners, clients, employees, bank managements, regulators and politicians. Inspired by Peter Boettke’s and Daniel Smith’s for a “Quest for Robust Political Economy” of monetary policy we could say we need a “Robust Political Economy of Financial Regulation”. I believe that Connor’s and O’Kelly’s paper contributes to this. Hence, if we want to “design” good banking regulation we fundamentally need a property rights perspective or even in a broader sense a “Financial Constitution” in the spirit of James Buchanan’s “Monetary Constitution”. Concluding, yes we might learn something about banking crisis and banking regulation by studying finance theory, but we will probably learn a lot more by studying Law and Economics and Public Choice Theory. Studying Public Choice theory can be very depressing for would-be reformers as they learn about what we could call the Iron Law of Public Choice. The students of Public Choice theory will learn from Bill Niskanen that bureaucrats has an informational advantage that they will use to maximizes budgets. They will learn that interest groups will lobby to increase government subsidies and special favours. Gordon Tulluck teaches us that groups will engage in wasteful rent-seeking. Mancur Olson will tell us that well-organized groups will highjack the political process. Voters will be rationally ignorant or even as Bryan Caplan claims rationally irrational. Put all that together and you get the Iron Law of Public Choice – no matter how much would-be reformers try they will be up against a wall of resistance. Reforms are doomed to end in tears and reformers are doomed to end depressed and disappointed. The problem according to Pete is that we (the reformers) assume that policy makers are benevolent dictators that without resistance will just implement reform proposals. Said in another way Pete argues that to evaluate reform proposals we need to analysis whether it is realistic the vote maximizing politicians, the ignorant voters and the budget maximizing bureaucrats will go along with reform proposals. So Scott is suggesting – for the sake of the argument – to ignore the Iron Law of Public Choice, while Pete is arguing that you should never ignore Public Choice theory. I must say that I think Pete’s criticism of Scott (and the rest of Market Monetarist crowd) misses the point in what Market Monetarists are indeed saying. First of all, the suggestion for a rule-based monetary policy in the form of NGDP targeting exactly takes Public Choice considerations into account as being in stark contrast to a discretionary monetary policy. In that sense NGDP Targeting should be seen as essentially being a Monetary Constitution in exactly same way as for example a gold standard. In fact I find it somewhat odd that Peter Boettke is always so eager to argue that NGDP targeting will fail because it as a rule will be manipulated – or in my wording would be crushed by the Iron Law of Public Choice. However, I have never heard Pete argue in the same forceful fashion against the gold standard. That is not to say that Pete has argued that the gold standard cannot be manipulated. Pete has certainly made that point, but why is it he is so eager to exactly to show that a “market driven” NGDP targeting regime would fail? When it comes to comparing NGDP targeting with other regimes of central banking (and even free banking) what are the arguments that NGDP targeting should be more likely to fail because of the Iron Law of Public Choice than other regimes? After all should we criticize Larry White and George Selgin for ignoring Public Choice theory when they have advocated Free Banking? After all even the arguably most successful Free Banking regime the Scottish Free Banking experience before 1844 in the end “failed” – as central banking in the became the name of the game across Britain – including Scotland. Public Choice theory could certainly add to understanding why Free Banking died in Scotland, but that mean that Larry and George are wrong arguing in favour Free Banking? I don’t think so. So yes, Scott is choosing to ignore the Iron Law of Public Choice, but so is Austrians (some of them) when they are arguing for a gold standard and so is George Selgin when he is advocate Free Banking. As Scott rightly says no monetary regime is “foolproof”. They can all be “attacked” by policy makers and bureaucrats. Any regime can be high-jacked and messed up. Furthermore, Pete seems to fail to realize that Scott’s proposal is to let the market determine monetary conditions based on an NGDP futures set-up. Gone would be the discretion of policy makers. This is exactly taking into account Public Choice lessons for monetary policy rather than the opposite. Here Hayek is basically making a Public Choice argument – the West is doomed. There will not be the political backing for the necessary measures to defeat inflation and instead will be on a Road to Serfdom. Interestingly enough this is nearly a Marxist argument. Capitalism will be defeated by the Iron Law of Public Choice. There is no way around it. However, today we know that Hayek was wrong. Inflation was defeated. Price controls are not widespread in Western economies. Instead we have since the end of 1980s seen the collapse of Communism and free market capitalism – in more or less perfect forms – has spread across the globe. And during the Great Moderation we have had an unprecedented period of monetary stability around the world and you have to go to Sudan or Venezuela to find the kind of out of control inflation and price controls that Hayek so feared. Something happened that beat the Iron Law of Public Choice. The strictest defeatist form of Public Choice theory was hence proven wrong. So why was that? Hence, according to Mises ideas are more important than anything else. I disagree on that view, but I on the other clearly think that ideas – especially good and sound ideas – can beat the Iron Law of Public Choice. Reforms are possible. Otherwise Hayek would have been proven right, but he was not. Inflation was defeated and we saw widespread market reforms across the globe in 1980s and 1990s. I believe that NGDP targeting is an idea that can change the way monetary policy is conducted and break the Iron Law of Public Choice and bring us closer to the ideal of a Monetary Constitution that both Peter Boettke and I share. PS Don Boudreaux also comments on Pete’s blog post. Is Market Monetarism just market socialism? I very much apprecaite Pete’s kind words about my post and fundamentally think that we are moving towards common ground. Update 2: Scott Sumner also comments on Pete’s post. Read also the comment section – George Selgin has some very insightful comments on the relationship between Free Banking and NGDP level targeting. Nobel Prize winning economist and founding father of the Public Choice school James M. Buchanan has died at age 93. His friends and students have already offered many kind words in his memory. Here I quote two of my friends professors Steve Horwtiz and Peter Kurrild-Klitgaard. James M. Buchanan, RIP. If making a difference is what matters, he was one of the five most influential thinkers of the last 50 years. Sharp as a knife into his 90s and always the scholar. …No one who wishes to talk responsibly about politics can be ignorant of public choice theory. No one should ever invoke the language of market failure (including externalities) without having digested his work on government failure. And people who run around talking about the constitution better be able to understand something of constitutional political economy. Beyond all of that, he was a role model of the old school scholar: widely read and properly skeptical of turning economics into an engineering discipline. He was, at bottom, a humanist and a liberal in the oldest and best senses of the terms. And best of all: he was utterly unimpressed by degrees from fancy schools. Buchanan produced an enormous amount of scholarly works including numerous books in his long life. Best known is probably The Calculus of Consent which he co-authored with Gordon Tullock. 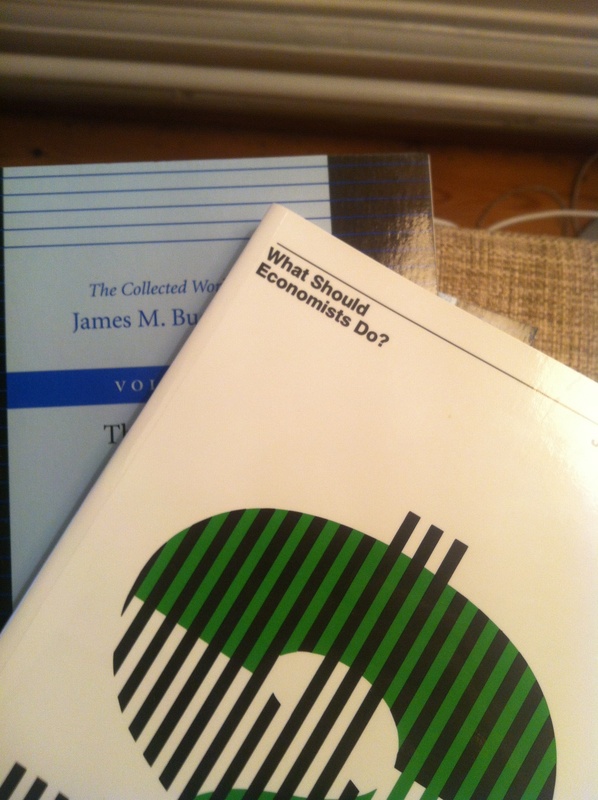 However, the works that had the biggest influence on my own thinking undoubtedly was “What should economists do?” and “Cost and Choice”. James Buchanan, sought to bring his extensive work on rule-making to bear in envisioning a monetary regime that could operate within a contemporary democratic setting. From the start, Buchanan (1999) eschewed the ‘presuppositions of Harvey road’ that held that economic policy would be crafted and implemented by a group of benevolent and enlightened elites. Buchanan set out to make the case for a monetary regime using comparative institutional analysis that compared monetary regimes in real, not ideal settings. Buchanan (1999) believed that it was not so much the specific type of monetary regime adopted, but the set of rules that defined that regime. Buchanan argued that the brick standard, a labor standard, or a manager confined by well-defined rules, would all put a stop to the government growth let loose by the fiscal profligacy encouraged by the wide scale acceptance of Keynesian ideas in the political realm (see Buchanan and Wagner (2000). The brick standard, as defined by Buchanan, would be a monetary regime that allowed anyone to go to the mint with a standard building brick of a specified quality and exchange it for the monetary unit, and vice versa. As the general price level fluctuated, market forces would cause automatic adjustments as people would exchange money for bricks when the price level rose above the equilibrium level, and bricks for money when the price level fell below the equilibrium level. Under this regime, market actors, guided by profits and losses would be the mechanism that achieved price predictability, not a government-entity entrusted with the goal of achieving it. In addition, a brick standard would, most likely, divorce domestic monetary policy from international balance of payment and exchange rate policies due to the fact that a brick standard would be unsuitable for those purposes. For Buchanan (1999, 417), it came down to a toss-up between a brick type standard and a limited manager. What mattered most for monetary predictability was that the rules that set up the monetary regime must be of the ‘constitutional’ variety. In other words, the rules must be set to be ‘relatively absolute absolutes’ in order to protect them from tampering. The short answer to the question in the headline is no, but I can understand if somebody would suspect so. I will discuss this below. If there had been an internet back in the 1920s then the leading Austrian economists Ludwig von Mises and Friedrich Hayek would have had their own blogs and so would the two leading “market socialists” Oskar Lange and Abba Lerner and in many ways the debate between the Austrians and the market socialists in the so-called Socialist Calculation Debate played out as debate do today in the blogosphere. Recently I have given some attention to the need for Market Monetarists to stress the institutional context of monetary institutions and I think the critique by for example Daniel Smith and Peter Boettke in their recent paper “Monetary Policy and the Quest for Robust Political Economy” should be taken serious. Smith’s and Boettke’s thesis is basically that monetary theorists – including – Market Monetarists tend to be overly focused on designing the optimal policy rules under the assumption that central bankers acts in a benevolent fashion to ensure a higher good. Smith and Boettke argue contrary to this that central bankers are unlikely to act in a benevolent fashion and we therefore instead of debating “optimal” policy rules we instead should debate how we could ultimately limit central banks discretionary powers by getting rid of them all together. Said in another way – you can not reform central banks so they should just be abolished. I have written numerous posts arguing basically along the same lines as Boettke and Smith (See fore example here and here). I especially have argued that we certainly should not see central bankers as automatically acting in a benevolent fashion and that central bankers will act in their own self-interests as every other individual. That said, I also think that Smith and Boettke are too defeatist in their assessment and fail to acknowledge that NGDP level targeting could be seen as step toward abolishing central banks altogether. From the Smith-Boettke perspective one might argue that Market Monetarism really is just the monetary equivalent of market socialism and I can understand why (Note Smith and Boettke are not arguing this). I have often argued that NGDP targeting is a way to emulate the outcome in a truly competitive Free Banking system (See for example here page 26) and that is certainly a common factor with the market socialists of the 1920s. What paretian market socialists like Lerner and Lange wanted was a socialist planned economy where the allocation would emulate the allocation under a Walrasian general equilibrium model. So yes, on the surface there as some similarities between Market Monetarism and market socialism. However, note here the important difference of the use of “market” in the two names. In Market Monetarism the reference is about using the market in the conduct of monetary policy. In market socialism it is about using socialist instruments to “copy” the market. Hence, in Market Monetarism the purpose is to move towards market allocation and about monetary policy not distorting relative market prices, while the purpose of market socialism is about moving away from market allocation. Market Monetarism provides an privatisation strategy, while market socialism provides an nationalisation strategy. I am not sure that Boettke and Smith realise this. But they are not alone – I think many NGDP targeting proponents also fail to see these aspects . George Selgin – who certainly is in favour of Free Banking – in a number of recent papers (see here and here) have discussed strategies for central bank reforms that could move us closer to Free Banking. I think that George fully demonstrates that just because you might be favouring Free Banking and wanting to get rid of central banks you don’t have to stop reforms of central banking that does not go all the way. This debate is really similar to the critique some Austrians – particular Murray Rothbard – had of Milton Friedman’s proposal for the introduction of school vouchers. Rothbard would argue that Friedman’s ideas was just clever socialism and would preserve a socialist system rather than break it down. However, even Rothbard acknowledged in For a New Liberty that Friedman’s school voucher proposal was “a great improvement over the present system in permitting a wider range of parental choice and enabling the abolition of the public school system” (I stole the quote from Bryan Caplan). Shouldn’t Free Banking advocates think about NGDP level targeting in the same way? I’ve noticed that when I discuss economic policy with other free market types, it’s easier to get agreement on broad policy rules than day-to-day discretionary decisions. I have noticed the same thing – or rather I find that when pro-market economists are presented with Market Monetarist ideas based on the fact that we want to limit the discretionary powers of central banks then it is much easier to sell our views than when we just argue for monetary “stimulus”. I don’t want central bank to ease monetary policy. I don’t want central banks to tighten monetary policy. I simply want to central banks to stop distorting relative prices. I believe the best way to ensure that is with futures based NGDP targeting as this is the closest we get to the outcome that would prevail under a truly free monetary system with competitive issuance of money. I have often argued that NGDP level targeting is not about monetary stimulus (See here, here and here) and argued that NGDP level targeting is the truly free market alternative (see here). This in my view is the uniting view for free market oriented economists. We can disagree about whether monetary policy was too loose in the US and Europe prior to 2008 or whether it became too tight in 2008/9. My personal view is that both US and European monetary policy likely was (a bit!) too loose prior to 2008, but then turned extremely tight in 2008/09. The Great Depression was not caused by too easy monetary policy, but too tight monetary policy. However, in terms of policy recommendations is that really important? Yes it is important in the sense of what we think that the Fed or the ECB should do right now in the absence of a clear framework of NGDP targeting (or any other clear nominal target). However, the really important thing is not whether the Fed or the ECB will ease a little bit more or a little less in the coming month or quarter, but how we ensure the right institutional framework to avoid a future repeat of the catastrophic policy response in 2008/9 (and 2011!). In fact I would be more than happy if we could convince the ECB and the Fed to implement NGDP level target at the present levels of NGDP in Europe and the US – that would mean a lot more to me than a little bit more easing from the major central banks of the world (even though I continue to think that would be highly desirable as well). What can Scott Sumner, George Selgin, Pete Boettke, Steve Horwitz, Bob Murphy and John Taylor all agree about? They want to limit the discretionary powers of central banks. Some of them would like to get rid of central banks all together, but as long as that option is not on the table they they all want to tie the hands of central bankers as much as possible. Scott, Steve and George all would agree that a form of nominal income targeting would be the best rule. Taylor might be convinced about that I think if it was completely rule based (at least if he listens to Evan Koeing). Bob of course want something completely else, but I think that even he would agree that a futures based NGDP targeting regime would be preferable to the present discretionary policies. So maybe it is about time that we take this step by step and instead of screaming for monetary stimulus in the US and Europe start build alliances with those economists who really should endorse Market Monetarist ideas in the first place. 1) Do you agree that in the absence of Free Banking that monetary policy should be rule based rather than based on discretion? 2) Do you agree that markets send useful and appropriate signals for the conduct of monetary policy? 3) Do you agree that the market should be used to do forecasting for central banks and to markets should be used to implement policies rather than to leave it to technocrats? For example through the use of prediction markets and futures markets. (See my comments on prediction markets and market based monetary policy here and here). 4) Do you agree that there is good and bad inflation and good and bad deflation? 5) Do you agree that central banks should not respond to non-monetary shocks to the price level? 7) Do you agree that the appropriate target for a central bank should be to the NGDP level? I am pretty sure that most free market oriented monetary economists would answer “yes” to most of these questions. I would of course answer “yes” to them all. So I suggest to my fellow Market Monetarists that these are the questions we should ask other free market economists instead of telling them that they are wrong about being against QE3 from the Fed. In fact would it really be strategically correct to argue for QE3 in the US right now? I am not sure. I would rather argue for strict NGDP level targeting and then I am pretty sure that the Chuck Norris effect and the market would do most of the lifting. We should basically stop arguing in favour of or against any discretionary policies. PS I remain totally convinced that when economists in future discuss the causes of the Great Recession then the consensus among monetary historians will be that the Hetzelian-Sumnerian explanation of the crisis was correct. Bob Hetzel and Scott Sumner are the Hawtreys and Cassels of the day. I am beginning to get a serious problem in keeping up with all the interesting papers, which are being published at the moment. The latest paper that I clearly have to read is a rather impressive paper (124 pages!) by Peter Boettke and Daniel Smith. The topic of Pete’s and Daniel’s paper – which I still have not read – is basically a discussion of the public choice aspects of central banking. This is a topic I find extremely interesting and I look very much forward to reading the paper in the near future (I will be on vacation next week – so maybe…). The economics profession not only failed to predict the recent financial crisis; it has been struggling in its aftermath to reach a consensus on the cause(s) of the crisis. While competing narratives are being offered and evaluated, the narrow scope of the debate on the strictly technical aspects of monetary policy that have contributed to and prolonged the crisis has precluded the a broader examination of questions of political economy that may prove to be of greater import. Attempting to find the technically optimal policy is futile when the Federal Reserve’s independence is undermined by the political influences of contemporary democracy. Nobel Laureates F.A. Hayek, Milton Friedman, and James Buchanan each sought ways to constrain and protect a monetary authority from political pressures in their research. Each one ended up rejecting the possibility of doing so without a fundamental restructuring of our monetary regime. Hayek turned to denationalization, Buchanan to constitutionalism, and Friedman to binding rules. We incorporate their experiences to make a case for applying the concepts of robust political economy to the Federal Reserve. Robust political economy calls for relaxing idealized assumptions in order to seek out institutional regimes that can overcome both the epistemic and motivational hurdles that characterize contemporary democratic settings. Even though I have not read the paper yet I have a pretty good idea where Pete and Daniel are going – they are questioning whether we can convince central bankers to do the right thing. Market Monetarists want central banks to target the nominal GDP level. We want central banks to follow rules. However, we are up against the powers of public choice theory. One can easily argue that central bankers will never give up their discretionary powers and politicians will always interfere with the conduct of monetary policy. It is simply in their selfish interest to do so and therefore the project to convince central bankers to do the right thing – NGDP level targeting – is just a waste of time. We should rather focus on fundamental institutional reforms. This is fundamentally the issue that any reformist in any area will have to struggle with – how can we expect those in power to give up that power? How can we implement reforms? A way to beat the logic of public choice theory is through the powers of ideas. Milton Friedman was in the business of ideas all his life. The powers of governments – and central banks – can be rolled back through the sheer power of strong arguments and good ideas. It is never going to be easing, but when Scott Sumner started to blog about NGDP targeting nobody listened. Now Federal Reserve scholars are serious talking about it and doing research about it and even the FOMC has debate NGDP targeting. There is therefore reason to be optimistic. But I will be the first to admit that I find it unlikely that the Federal Reserve or the ECB will start targeting the NGDP level anytime – neither do I find it likely that these institutions will give up their discretionary powers. That said I never had any illusions that they would and I do agree that we need to talk about the fundamental institutional issues of central banking. PS Boettke and Smith does not explicitly mention Market Monetarists or NGDP targeting in paper, but a draft version of the paper was presented at the 2010 Southern Economic Association Annual Meeting Session “Are There Public Choice Problems with Nominal Income Targeting?” Pete has earlier written a blog post on this issue directly challenging the Market Monetarist position: “Political Economy Questions Which Even Market Monetarists Might Want to Think About”. Here is my response to that post. PPS I have often argued that there is certainly no conflict between favouring NGDP level targeting for central bank and favouring Free Banking as NGDP level targeting in the same way as school vouchers can be seen as a privatization strategy. My outburst over the weekend against the Rothbardian version of Austrian business cycle theory was not my normal style of blogging. I normally try to be non-confrontational in my blogging style. Krugman-style blogging is not really for me, but I must admit my outburst had some positive consequences. Most important it generated some good – friendly – exchanges with Steve Horwitz and other Austrians. Steve’s blog post in response to my post gave some interesting insight. Most interesting for me was that Steve highlighted Robert Higgs’ “Regime Uncertainty” theory of the Great Depression. Overall I think Higgs’ concept makes a lot of sense and there is no doubt that uncertainty about economic policy had negative impact on the performance of the US economy during the Great Depression. I would especially highlight that the so-called National Industrial Recovery Act (NIRA) and the Smoot-Hawley tariff act not only had directly negative impact on the US economy, but mostly likely also created uncertainty about core capitalist institutions such as property rights and the freedom of contract. This likely hampered investment growth in the way described by Higgs. However, I am somewhat critical about the “transmission mechanism” of this regime uncertainty. From the Market Monetarist perspective recessions are always and everywhere a monetary phenomenon. Hence, in my view regime uncertainty can only impact nominal GDP if it in someway impact monetary policy – either through money demand or the money supply. This is contrary to Higgs’ description of the “transmission mechanism”. Higgs’ description is – believe it or not – fundamentally Keynesian in its character (no offence meant Bob): An increase in regime uncertainty reduces investments and that directly reduces real GDP. This is exactly similar to how the fiscal multiplier works in a traditional Keynesian model. In a Market Monetarist set-up this will only have impact if the monetary authorities allowed it – in the same way as the fiscal multiplier will only be higher than zero if monetary policy allow it. See my discussion of fiscal policy here. Hence, from a Market Monetarist perspective the impact on investment will be only important from a supply side perspective rather than from a demand side perspective. That, however, does not mean that it is not important – rather the opposite. What makes us rich or poor in the long run is supply side factor and not demand side factors. While a drop in investment surely has a negative impact on the long run on real GDP growth I would suggest that we should focus on a slightly different kind of regime uncertain than the uncertainty discussed by Higgs. Or rather we should also focus on the uncertainty about the monetary regime. Let me illustrate this by looking at the present crisis. The Great Moderation lasted from around 1985 and until 2008. This period was characterised by a tremendously high degree of nominal stability. Said in another way there was little or no uncertainty about the monetary regime. Market participants could rightly expect the Federal Reserve to conduct monetary policy in such a way to ensure that nominal GDP grew around 5% year in and year out and if NGDP overshot or undershot the target level one year then the Fed would makes to bring back NGDP on the “agreed” path. This environment basically meant that monetary policy became endogenous and the markets were doing most of the lifting to keep NGDP on its “announced” path. However, the well-known – even though not the official – monetary regime broke down in 2008. As a consequence uncertainty about the monetary regime increased dramatically – especially as a result of the Federal Reserve’s very odd unwillingness to state a clearly nominal target. This increase in monetary regime uncertainty mean that market participants now have a much harder time forecasting nominal income flows (NGDP growth). As a result market participants will try to ensure themselves negative surprises in the development in nominal variables by keeping a large “cash buffer”. Remember in uncertain times cash is king! Hence, as a result money demand will remain elevated as long as there is a high degree of regime uncertainty. As a consequence the Federal Reserve could very easily ease monetary conditions without printing a cent more by clearly announcing a nominal target (preferably a NGDP level target). Hence, if the Fed announced a clear nominal target the demand for cash would like drop significantly and for a given money supply a decrease in money demand is as we know monetary easing. This is the direct impact of monetary regime uncertainty and in my view this is significantly more important for economic activity in the short to medium run than the supply effects described above. However, it should also be noted that in the present situation with extremely subdued economic activity in the US the calls for all kind of interventionist policies are on the rise. Calls for fiscal easing, call for an increase in minimum wages and worst of all calls for all kind of protectionist initiatives (the China bashing surely has gotten worse and worse since 2008). This is also regime uncertainty, which is likely to have an negative impact on US investment activity, but equally important if you are afraid about for example what kind of tax regime you will be facing in one or two years time it is also likely to increase the demand for money. I by the way regard uncertainty about banking regulation and taxation to a be part of the uncertainty regarding the monetary regime. Hence, uncertainty about non-monetary issues such as taxation can under certain circumstances have monetary effects. Concluding at the moment – as was the case during the Great Depression – uncertainty about the monetary regime is the biggest single regime uncertain both in the US and Europe. This monetary regime uncertainty in my view has tremendously negative impact on the economic perform in both the US and Europe. So while I am sceptical about the transmission mechanism of regime uncertainty in the Higgs model I do certainly agree that we need regime certain. We can only get that with sound monetary institutions that secure nominal stability. I am sure that Steve Horwitz and Peter Boettke would agree on that. Peter Boettke over at Coordination Problem a post in which he challenge Market Monetarists to think about some political economy questions. “Now I understand that much has changed since 1962 about the state of the art in central banking and the debate over rules versus discretion. But after 2008, can we really say that anymore? So while I might agree with the technical theory point about monetary equilibrium, the question remains as to what institutional arrangement best fits. Central banking as a system simply might not be capable of operationalizing the lessons from monetary equilibrium theory. The ability of the system to pursue optimal policy rules may beyond its reach and not merely for reasons of interest group manipulation, but due to an epistemic constraint. That is actually how I read the critical aspects of Selgin’s The Theory of Free Banking. I think Peter raises some very important issues. Basically Peter argue that it is more important that we discuss the institutional arrangement guiding the monetary regime rather than just the day-to-day conduct of monetary policy. I am happy that Peter is raising these issues. I have often argued that Market Monetarists should never argue in favour of “stimulus” in the keynesian discretionary fashion and rather stress that we are strongly in favour of rules. We are certainly intellectually indebted to Hayek and Friedman. Selgin’s Monetary Credo – Please Dr. Taylor read it! We favour Futarchy in monetary policy – we want markets rather than policy makers to determine monetary policy. Scott Sumner has argued in favour of using NGDP futures to directly determine monetary policy. I while endorse Scott’s proposal for NGDP futures I have further argued that central banks should use predictions markets to do macroeconomic forecasting and for implementation of monetary policy. “Market” in Market Monetarism is not just a buzzword – it is an integral part of our thinking. In fact I have earlier argued that futures based NGDP level targeting could be seen as privatisation strategy and a first step toward the total privatisation of the supply of money. Not all Market Monetarists bloggers are in favour of Free Banking, but there is no doubt that a number of us are highly sympathetic to the idea of privatisation of the monetary regime. So I think we have both been thinking about and answered Peter’s question. Peter, there is no reason to worry – we are loyal disciples of Hayek and Friedman – also when it comes to institutional questions.